Press dinner at Byblos yesterday. Good company and great Lebanese fare. Everything we tried tasted fresh and good. Regarding their cooking style, the restaurateur and chef Sabeh Kachouh mentioned they believe in keeping it simple. And in my opinion, that’s a testimony to these ‘simple’ preparations that bring out great flavors in foods. 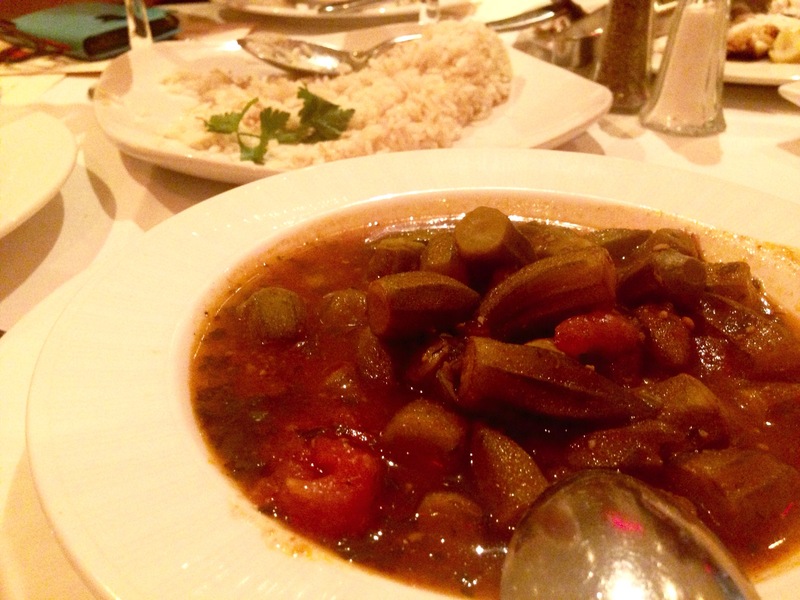 Lebanese wine – Massaya Classic is what we had. It’s a blend of Cinsault, Cabernet Sauvignon and Syrah. Pretty well rounded and crisp. Charcoal grilled eggplant with tahini, olive oil, lemon juice, and garlic. Thick creamy yogurt with a soft cream cheese like texture, it was topped with oil and dry mint. Mashed chickpeas pureed with tahini, lemon and garlic. And lots of olive oil. Tender to bite, cooked with olive oil and tomatoes, served cold. These small, deep fried balls made of crushed chick peas and coriander served with tahini sauce were one of the nicer ones I’ve eaten – crisp on the outside, soft inside. Filo pastry filled with halloumi cheese, deep fried. I liked them a lot. The pastry sheets were thin. Not a fan, but these were pretty good. Homemade dough sprinkled with thyme, sesame, olive oil and sumac. Drenched in oil, these potato pieces, tossed with chopped cilantro, garlic, and pepper tasted superb. Okra stewed with tomato sauce served. The okra, they said they import from Egypt. And though it was frozen, it was still tender to bite. Even unlike the fresh ones you get here. How I miss my ‘bhindi’. The Lebanese/ Middle Eastern music playing in the restaurant was perfect for the evening. I find that music quite energizing and uplifting. The service was warm and friendly and the amiable owners, Sabeh and Sonia and patiently addressed all our questions. The place seats about 90. Nice collection of wines (they have a full bar). Good food and lots of variety. Add to it live music and belly dancing. How does that sound for a festive Saturday night with a bunch of friends or family?